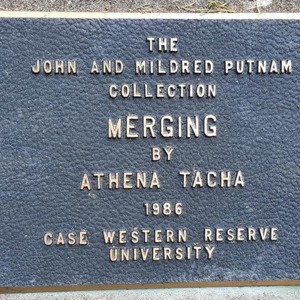 We can get a fine insight into Tacha’s work through the book Dancing in the Landscape, where she describes how one side of the statue parallels the main campus path that bisects Mather Quad on a diagonal, and the other side of the statue parallels Bellflower Road. 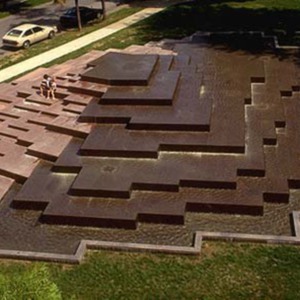 The conceit of the piece and the name stem primarily from two historic events: the merging of the Case Institute of Technology with the Western Reserve University, which occurred 20 years prior to the installation, and the merging of the University with the Women’s College. The wet and dry sides of the fountain meet on an oblique instead of a perfectly head-on, partially inspired by natural geological occurrences, such as the collision of tectonic plates. She describes either side of the statue as “rippling away” from the “jagged interface of a new rhythmic order” caused by the unique angle of meeting. 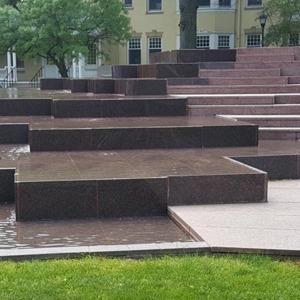 One side is polished red granite, which, when clean, steadily shines the light of the sun off its flat surfaces, like the body at rest that sits on the stairs. The other side, however, has running water that sends that same sunlight dancing and shimmering, like the body in motion that climbs the staircase. 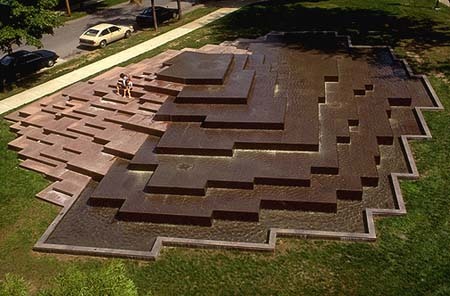 Merging accomplishes all the goals (spoken or unspoken) that a sculptural fountain on a college campus should: it is aesthetically pleasing, peaceful, active in the space, and next to impossible for an inebriated college student to drown in. A major concern of Tacha’s (and many of the artists represented) are the maintenance issues that come with public art. Specifically with Tacha, inclusion of water in a piece contributes a whole new slew of problems with upkeep. Graffiti, trash, and controversy accompany almost any public piece worth its salt, however Merging saw issues with unexpected algae growth, drainage problems, and destructive pranks. For instance, soon after its installation, a group of mischievous students poured detergent into the water, severely hampering the ability for the piece to properly drain and recycle water. Even today, the granite tops are not polished or smooth: they have lost their effectiveness, which has hindered the overall impact of the piece. Tacha designates the lack of budget towards upkeep as a main problem for public art like Merging. As important as it is to be able to commission/purchase the piece, she argues that it is just as important to have money ready for repairs and maintenance, not unlike a vehicle. Merging is a prime example of how a lack of maintenance can affect how a piece of art functions in a space: both visually and literally, and makes a great case as to why art both deserves and necessitates our respect. 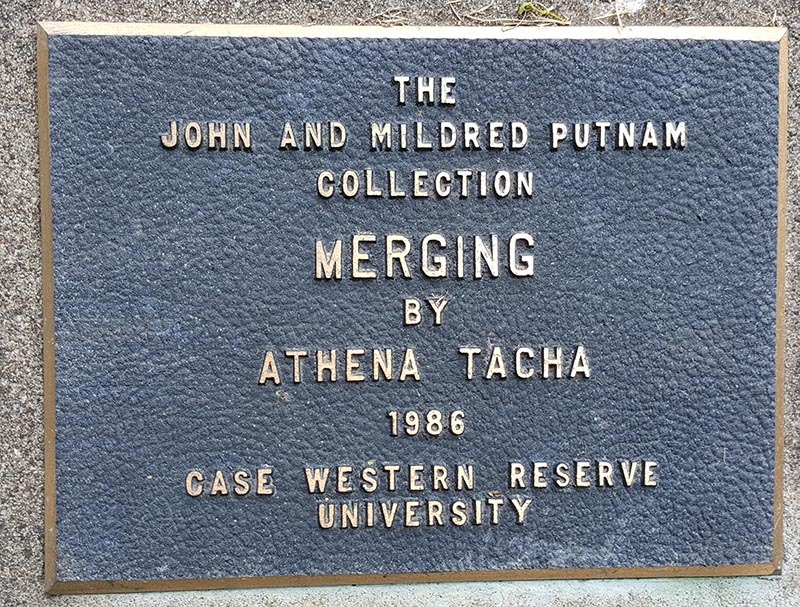 : Athena Tacha, “Merging,” Ohio Outdoor Sculpture Inventory, accessed April 18, 2019, http://oosi.sculpturecenter.org/items/show/191.